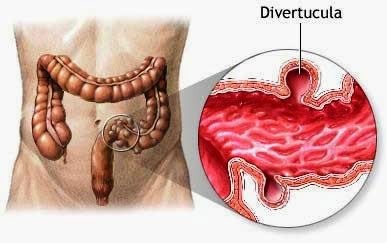 Diverticular disease is a condition which occurs when pouches of tissue, commonly known as diverticula, pass through the muscular layer of the bowel. Classically, the lowest most portion of the large bowel, namely the sigmoid colon, is most commonly affected. In certain cases the diverticula may become obstructed by faecal matter which results in acute diverticulitis. It is roughly estimated that 50 % of the population over the age of 50 are affected by the presence of diverticula. In the vast majority of cases diverticular disease is asymptomatic. Common symptoms of the disease however manifest as abdominal distension and pain in association with diarrhoea or constipation. Abdominal pain is predominantly dull and comes in waves and primarily affects the left lower portion of the abdomen. Individuals may also experience significant nausea or vomiting or bleeding in their stool. The most common cause attributed to the condition is dietary. A diet low in fibre and high in fat results in the formation of hard compact stool.As a consequence the pressure within the bowel rises. In addition the muscles responsible for moving stool through the digestive tract are forced to work harder and with time subsequently become weaker. The end result is the formation of weakened areas within the bowel lining allowing for the bowel tissue to push through and form diverticula. Additional aetiological factors include bowel dysmotility and drugs such as steroids. The diagnosis of diverticular disease is primarily based on colonoscopy. This is a procedure whereby a camera is introduced through the back passage to examine the large bowel. Another diagnostic technique is via barium enema studies, a specialised x-ray utilising barium liquid introduced through the back passage. This allows for more specialised images of the large bowel to be obtained. In the case of acute diverticulits, a CT or ultrasound scan are the diagnostic interventions of choice. Treatment is essentially focused on the use of a high fibre diet and symptom control through the use of regular analgesia. If in the case of acute diverticulitis, individuals often require antibiotics such as metronidazole and ciprofloxacin. In repeated cases of diverticulitis or complications such as bowel obstruction, perforation or failure of medical therapy, surgery may be explored as an alternative intervention. The common complications of diverticular disease include infection, obstruction, bleeding and perforation. Infection may lead to the formation of pus collections commonly known as an abscess which requires surgical drainage. Infection may also cause bowel tissue to join together or to neighbouring surfaces to form an abnormal passageway known as a fistula which subsequently requires surgical intervention. Prognosis is favourable with early detection and intervention. In the case of first episode acute diverticulitis, approximately one third of individuals have a recurrence of disease.